Media is very powerful, and when consumed, it can affect ones attitude, decisions, values and beliefs. It can also affect what we eat, wear, the things we buy, and can influence our lifestyle. There is a Positive and a Negative side to Media. The Positive side is Media that is wholesome, uplifting, and educational. The Negative side is Media that is violent, vulgar, indecent and obscene. The negative side of media is harmful to all that watch, listen, or participate in it. The worry some part of Negative Media is that it is fast becoming more dominant (more negative than positive). This first Media lesson focuses on T.V., Movies, and Video games. 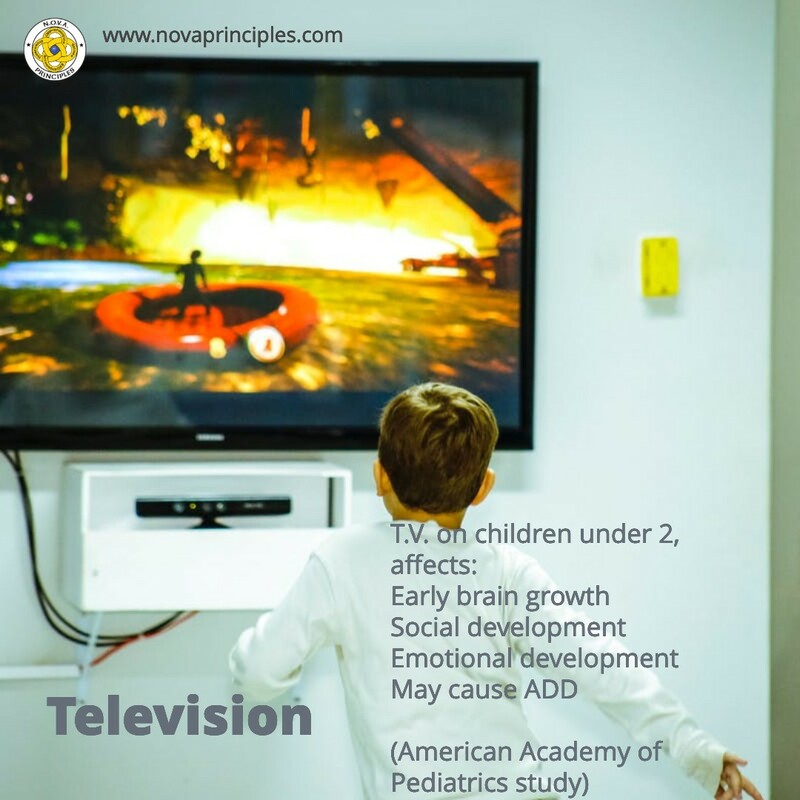 Though there is much that is positive and good about T.V., Movies, and Video games, there is also much that is negative and harmful. The Garbage in – Garbage out (What you put in is what you get out.) Principle is taught. Students are encouraged to memorize this new principle as it is a new N.O.V.A. Challenge question. 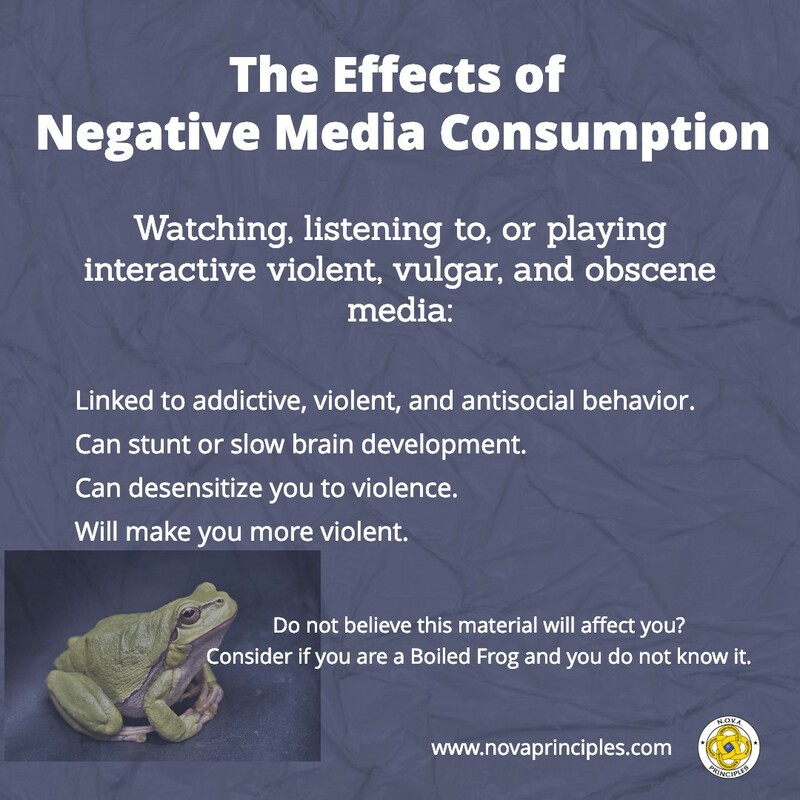 This Principle teaches students that watching, playing, or listening to Positive Media will have a Positive effect on them, likewise, watching, playing, or listening to Negative Media will have a Negative effect on them. Should anyone expect anything different? Students learn some important facts about T.V. watching. The average student their age: Watches 32 hrs. of T.V. per week, spends more time watching T.V. than being in school, and by the time they turn 18, will have watched over 200,000 acts of violence and 18,000 murders on T.V.. One reason why there’s so much violence, vulgarity, and obscene things on T.V., is that it is used to grab and hold people’s attention to watch more T.V.. T.V. can be a huge time waster, just think of what one could accomplish instead of watching so much T.V..
To protect people from the harmful & offensive content purposely put into T.V., Movies, and Video games, Rating Systems have been created and put in place to warn us. 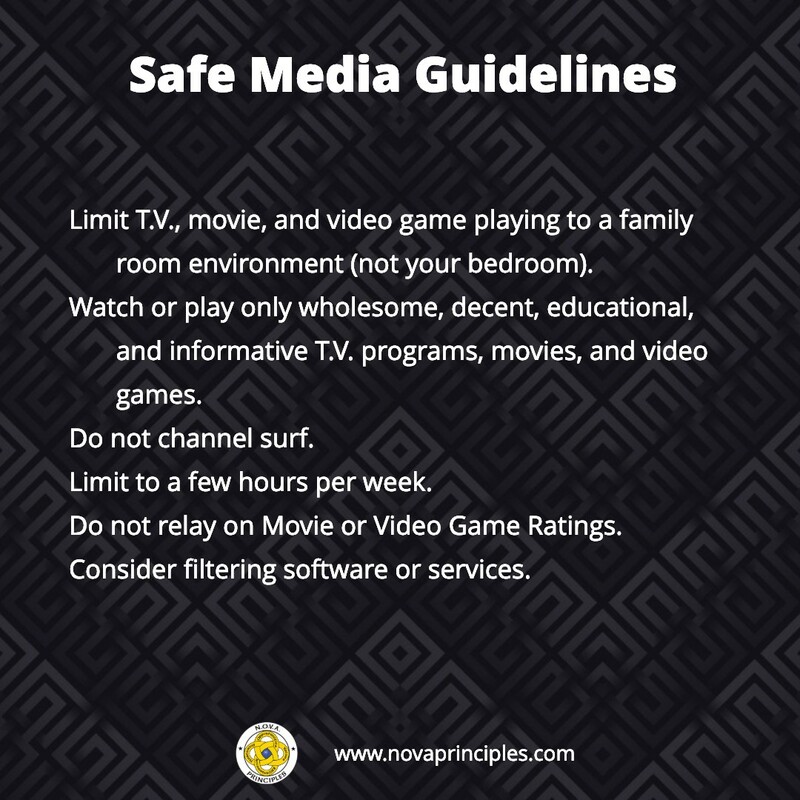 It is important to understand that if there were no harmful or offensive content put into T.V., Movies, or Video games, there would be no need for Rating Systems. 1. Limit T.V., Movie, and Video game playing to a family room environment. It’s not a good idea to have these things in a child’s bedroom. 2. Watch or play only decent, wholesome, educational, and informative T.V. programs, Movies, and Video games. 3. Know when and what channel the T.V. programs you want to watch are on before you turn on the T.V.. Don’t channel surf. 4. Limit the time you spend watching or playing T.V., Movies, and Video games to just a few hours per week. 5. Don’t just rely on the Ratings to decide what T.V., Movies or Video games you should or shouldn’t watch or play. Read reviews to find out if it contains offensive material. www.commonsensemedia.org and www.parentstv.org are excellent resources. 6. Consider using DVD filtering DVD players that can filter out offensive and harmful content of DVD’s. However, some movies even if filtered, shouldn’t be watched because the subject matter may be harmful or offensive. 7. There are many good constructive things to do instead of watching or playing T.V., Movies, and Video games. Go do them! ● Has been linked to addictive, violent, and antisocial behavior. ● Can stunt or retard brain development which can lead to lower grades in school. ● Can desensitize a person to violence and can lead a person to accept violence as normal behavior. ● Will make a person more violent. The only question is how much more violent will it make them. Students participate in an active learning lesson game that teaches them about “Neural Pathways”. Neural pathways are shortcuts that your brain creates to do things faster and more efficiently. Students are taught that their brain can create both Positive or Negative Neural Pathways. Students are advised not to create Negative Neural Pathways such as: Stealing, Lying, Swearing, Violence, Vulgarity, Drugs, crime, etc., as they can lead to addiction, troubles and problems. On the other hand, students are encouraged to create Positive Neural Pathways such as: Math, Science, Music, Sports, Reading, Writing, Art, etc., as they will lead them to their path of excellence and success. The “N.O.V.A. Pack” assignment is given and explained to the students. The “N.O.V.A. Pack” is an optional assignment where students forgo T.V., Movies, and Video games for seven straight days in a row (within a 3 week period of time) and write down on their assignment handout all the Positive things they do instead. The purpose of this assignment is to show students that there are better things to do than watching and playing too much media, much of which is harmful and offensive. If a student completes and turns in their N.O.V.A. Pack assignment handout, they become eligible to receive a N.O.V.A. Pack award. Winners of this award are judged based on the things they write down on their assignment handout. If you would like the opportunity to become an elite member of the “N.O.V.A. Parent Pack”, then one of the requirements is to complete the “N.O.V.A. Pack” assignment, by not watching or playing T.V., Movies, and Video games for seven straight days in a row (within a 3 week period of time). If you would like to do this assignment, go to www.novaprinciples.com and log-in with your user name and password you created when you registered (on the left side of the home page), click the “Courses” link that will appear on the left side of the home page when you log-in, click on the “N.O.V.A. Parent Pack Documents” link, and then select and print a copy of the “N.O.V.A. Pack” assignment handout and follow the instructions on the handout. We challenge all parents to participate and complete this assignment.